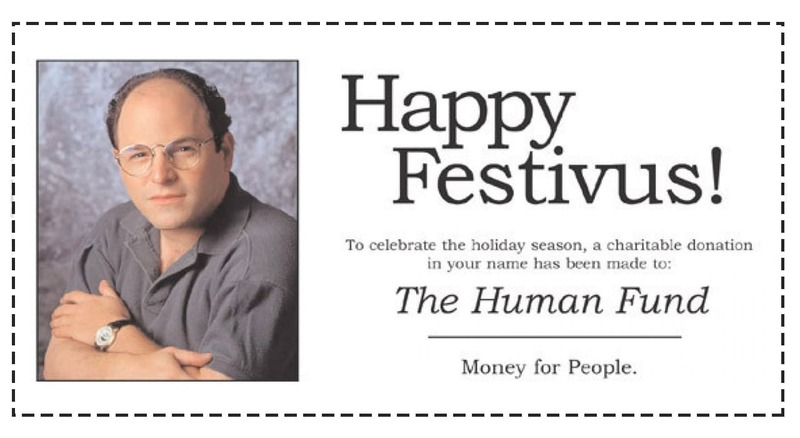 Looking for the perfect present for that traveler in your life? It’s not always easy! 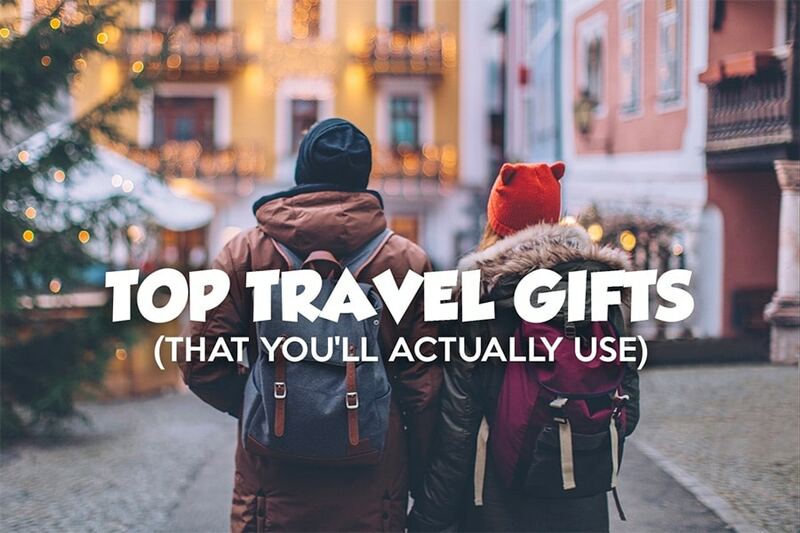 These are best travel gift ideas for wanderlust lovers, no matter what your budget. Working as a professional traveler for the past 9 years, I’ve become especially careful about what I pack on my trips around the world. There’s only so much room in your bag! Most travelers prefer to pack light. Experience! I’ve been traveling around the world almost non-stop for the past 9 years working as a professional travel blogger, visiting over 50 countries so far. This guide is also completely independent, with no sponsored content. The 2nd stage activated carbon filter reduces odor and chlorine aftertastes too. I also use mine for day-hiking trips. They have a minimalist straw version, for people who prefer their own container. Long-lasting filter – handles 1000 liters. There are a lot of Bluetooth speakers on the market, and I’ve tried many of them. The Sony simply has the best sound quality for its size, and the battery lasts up to 12 hours! Packing cubes! The best way to keep your luggage organized. My personal favorites are these from Eagle Creek. They weigh almost nothing and can hold a lot of clothing. The garment folder, in particular, is a wonderful way to keep your shirts and/or pants wrinkle-free. I use the medium sized cube for my collection of t-shirts and sweatshirts, and the smaller cube for underwear & socks. If you travel internationally quite a bit, your passport is going to get pretty beat-up. That’s why I love my simple, lightweight passport wallet from SimpacX. It gives just enough protection, without being bulky. You can also use it to hold credit cards, airline boarding passes, and extra cash. Keep your passport looking like new, so you don’t have any trouble at customs & immigration due to worn-out travel documents! In order to use your electronics in foreign countries, you’re going to need a great international travel adapter plug for different sockets. I’ve tried them all, and this one from BONAZZA is hands-down the best! Not only does it accept 2 or 3 pronged plugs for use in over 150 different countries, but it also includes 4 (!) USB inputs for charging your mobile devices. Plus the design is super slick, one of the smallest adapters on the market. Airline baggage fees are starting to get out of control. They want to charge you for EVERYTHING these days! To ensure you don’t get hit with paying extra, I always weigh my luggage with a portable luggage scale before checking in. This way, you can pack your bags to the maximum weight limit every time without going over. This backlit scale from Tarriss is lightweight and portable, with the ability to weigh luggage in both kilos or pounds. Some of my favorite travel gifts for men, based on my own personal experience as a traveling man. Like most of this list, I personally own all these items because they rock! While I started traveling as a budget backpacker 8 years ago, these days I’m older and a bit more fashion conscious. Especially in major international cities, or Europe. Packing a suit when you travel light is difficult, but not with the Bluffworks Gramercy Blazer. This fashionable jacket is wrinkle-free and can be rolled up and packed away easily. But it also looks and fits great, featuring a bunch of hidden pockets that help with traveling! It’s perfect for flying, or when you need to dress-up on the road. TUO stands for Travel Undergarment Organizer. Its purpose is to store anything travel-related, like socks, underwear, electronics, jewelry, or other loose items that some women tend to pack when they travel. Staying organized when you’re off galavanting around the world is so much easier using this fun little bag. You can hang it from towel racks or doors and unfold it for full access to your stuff in hotels or bathrooms. The BabylissPro Travel Dryer is the perfect hair dryer to pack in your bags for a vacation. It’s both powerful and small, a rare combination. If you aren’t staying in fancy hotels all the time, you may not have easy access to a good hairdryer. This one folds up nice and small, so it won’t take up too much room in your bag. A good set of tools is always useful when you travel, but it’s not realistic to pack a whole toolbox. The Leatherman Wave is the next best thing. Perfect for any job, adventure, or everyday task. In my opinion, a headlamp is an absolutely essential piece of travel gear for adventure travelers. My favorite is the water-resistant Black Diamond Storm. Headlamps give you hands-free access for reading a book in the dark, exploring a cave, returning from a hike after dark, or searching through your luggage in the middle of the night. It always comes in handy when I travel! Every adventure traveler needs a packable microfiber towel because it has a million different uses. It folds up super small and dries very quickly. Perfect for camping, or even staying in hostels. The Sea to Summit DryLite Towel comes in a few different colors and sizes. I’ve used it swimming in natural hot springs, to wipe down camera gear after a storm, and even as sun & dust protection in the desert. Whether you want to take photos of yourself when traveling solo or capture the magic of the northern lights, a tripod is a necessary tool. The Joby GorillaPod is small enough to take anywhere and strong enough to hold larger cameras too. One of my favorite pieces of camera gear, the Peak Design Camera Clip allows you to wear your camera on your belt, or on your backpack straps, keeping your hands free for other tasks. The camera adapter fits into most tripod heads too! Clipping in and out of the device is very quick and easy. You can even run with your camera strapped to your belt wearing this thing. Never miss another shot due to messing around with a camera bag. It’s a fantastic accessory for those who go hiking with their camera. The book Vagabonding is an excellent read about how to travel more, no matter what your budget or background. This book inspired me to take my first international trip! Learn how to take a break from your normal life and travel for a few weeks, or even a few years, while experiencing the world on your own terms. Get ideas for how to make traveling long-term possible, from others who’ve done the same. Ready to be inspired by other people’s travel stories? You can’t go wrong with a collection of The Best American Travel Writing Of 2018. Each year, the best of those stories are collected in this great series. You’ll find stories about what it’s like to be an American on vacation in France, being black on the Appalachian trail, modern technology in Korea, and the food scene in Moscow. Stories were curated by Cheryl Strayed, author of “Wild”. Well, that’s it for the best travel gifts for 2019. 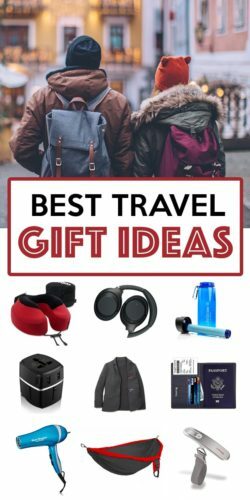 I hope you found some unique gift ideas for the traveler in your life who likes to pack light. I actually own and use most of these products regularly during my travels. Happy shopping this holiday season, and remember to get out there and explore the world yourself a bit too! Think of it as a little present to yourself.